So most of the world is aware that the new Star Wars movie was released there in late 2015, maybe not everyone knows of the Star Wars Irish Connection. It’s fair to say, we haven’t been keeping quiet about it, certainly everyone in Ireland has been talking about our Skellig Michael being included as a location in one of the most popular movies of all time. Skellig Michael is one of Ireland’s most westerly points, lying off the coast of Kerry. It’s reached by boat from Portmagee or Ballinskelligs but up to now, it’s been fairly off the beaten track. The sea crossing can be fairly rough as you are on the Atlantic Ocean and once you get there, it’s not easy going either, with hundreds of steps to climb without the help of a handrail. If you do want to include this fascinating World Heritage Site, do let us know and we can include it on your itinerary, we can book the crossing for you with the local boat companies. Sailings are weather dependent though as rough seas can happen all year round. It’s been on my list of things to do for quite some time but with three small children, I’m unlikely to do it for another while ….. in the meantime I’ll just have to watch the movie! 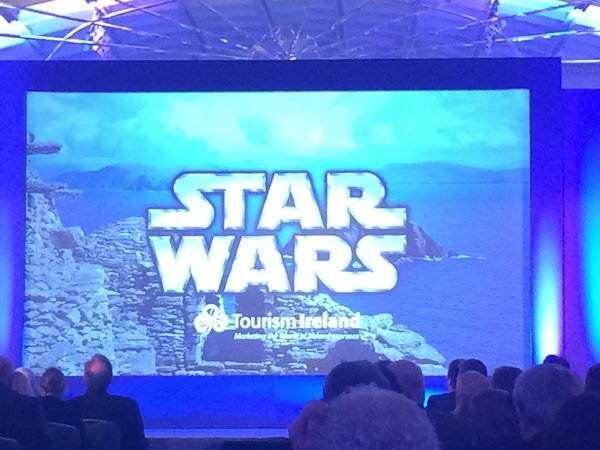 Here is a short video from Tourism Ireland explaining, Star Wars Irish Connection…. This video from Discover Ireland can help you start thinking about how to plan your trip.